Numerous threatened and endangered species have been affected by natural disasters this year, including the Mexican Spotted Owl and Attwater's Prairie Chicken. The Florida Grasshopper Sparrow and Imperial Amazon were among the endangered birds affected by Hurricanes Irma and Maria. Genome mapping is changing the way that bird species are classified, but genetics are not necessarily the only way to define a species. Northern Spicebush berries are strongly preferred by migrating Gray Catbirds over non-native berries. Golden-crowned Sparrow chicks can recognized the song of their species from the first note. 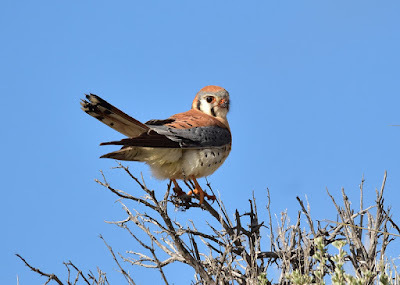 Endangered Ridgway's Hawks thrived after being translocated to set up an additional population in a new protected area on Hispaniola. Here are some suggestions for native trees that have beautiful fall foliage and provide food and shelter for birds. The endangered Helmeted Hornbill, on verge of extinction, was found at a new site outside of their known range in Borneo. The Interior Department wants to hike admission fees at 17 prominent national parks to $70 per carload (or $30 per pedestrian or cyclist). There is a public comment period on this proposal until November 23. Be careful to remove GPS or specific location information from photos of rare or endangered species posted online. The Trump administration wants to sell oil and gas drilling leases for 77 million acres of the Gulf of Mexico, which is basically all of the Gulf that has not been leased yet. The Gulf of Mexico is still feeling the effects of the Deepwater Horizon spill. Even without a spill that magnitude, we can expect the sale to result in more small spills (with are still harmful) as well as more greenhouse gases being put into the atmosphere. The Commerce Department has written a (so far secret) report on whether to open national marine sanctuaries to oil drilling. New research suggests that the worst-case scenarios for sea level rise could happen sooner than expected. Without rapid climate action, the New York City area could see Sandy-like disasters every 5 years by 2050. While a lot of work has gone into recovery and future resiliency, regional efforts to address sea level rise have lagged behind. The EPA prevented three of its scientists from speaking at a climate change conference in Rhode Island. The incident was the latest in a large trend of preventing the agency's climate data from reaching the public. Colombian scientists are planning expeditions to catalogue biodiversity in areas that were previously inaccessible due to the country's long-running civil war. The budget resolution contains a provision fast-tracking votes on selling off public lands. NOAA recommends keeping the North Atlantic Right Whale on the endangered species list. Given that Red Crossbills are likely to wander in northern areas this winter, eBird revised and reposted its guide to identifying and documenting Red Crossbills by call type. Grasshopper Sparrows constantly look for better territories, even in the midst of the breeding season. That finding grew out of an observation that color-banded individuals from a previous study would show up in unexpected locations. Bird specimens from the first decades of the 20th century show that there was much more carbon soot in the air than climate researchers had estimated. A new paper proposed a way to estimate observer expertise from eBird data, which potentially makes eBird's data more useful for conservationists. Geese may cluster in northern cities because of the advantages of safety from hunters and warmer conditions due to the urban heat island effect. Neighboring birds that respect territorial boundaries have less stress and better health. A photographer recorded a flock of nearly 10,000 Budgerigars around a watering hole in Australia. The reduction in Colombia's long civil war could bring more birding tourism to the country but could also open up biodiverse areas to logging and mining interests. Hurricane Maria wrecked habitat for the Puerto Rican Parrot. Surveys in coastal North Carolina and Georgia found Black Rails at less than 1% of potential nesting sites. The breeding failure of Adélie Penguins last year is leading to calls for a marine protected area to preserve their food sources. 10,000 Birds: Should Puerto Rico be Part of the ABA Area? spiderbytes: Announcing a new project: Recluse or Not? Scott Pruitt announced that the EPA would repeal the Clean Power Plan, but did not give a timeline for repealing or replacing it. The endangerment finding still compels the EPA to regulate greenhouse gases. Pruitt may be trying to avoid addressing carbon emissions for as long as possible. Repealing the Clean Power Plan and ignoring climate change will have terrible consequences for humans and wildlife. Last week, TransCanada dropped two proposed pipelines to bring tar sands oil eastward, but several similar projects remain on the table, including Keystone XL. Recognizing the full history of our public lands can be a step to making their use more inclusive. This year over 150 environmental activists and land protectors have been assassinated. New gecko species have been described from caves in Myanmar. The invasive Spotted Lanternfly is currently eating its way through eastern Pennsylvania and may soon spread to New Jersey as well. The insect prefers Ailanthus (an invasive tree) but has been recorded feeding on over 70 species of plants. Small beaked whales can take very long dives. Cougars in urban areas expend more energy than rural ones because of their greater nocturnal activity. Numerous species of snails are in danger of extinction. Cougars are mostly solitary but interact regularly, especially when feeding near territorial boundaries. Deer prefer native plants and change forest plant ecology to promote invasive plants. The Trump administration will not interfere with dam removal on the Klamath River, which should restore historic salmon runs on the river. 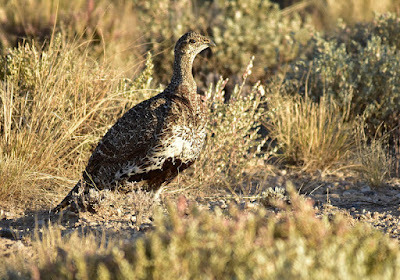 The Trump administration is attempting to undo the voluntary management program that the Obama administration put in place to protect the Greater Sage-Grouse and prevent it from needing Endangered Species Act protections. This should serve as a warning to future administrations against trying to sidestep using the ESA when a species is declining and needs protection. This week the administration also denied endangered protections for 25 species, including the Bicknell's Thrush. Data from monitoring of the yearly 9/11 tribute shows how much urban light pollution affects migrating birds. Scientists from Hawk Mountain found that climate change is shifting the timing of seasonal migration. 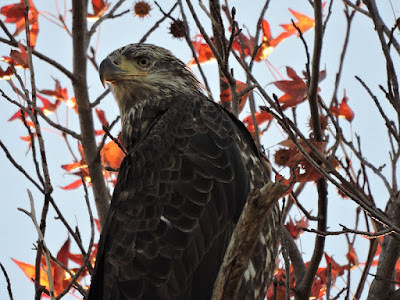 Eastern North American raptors now spend more time on their breeding grounds and migrate later in the fall. A genetic study of Budgerigars found a gene involved in producing yellow pigments, and a mutation in that gene turns the birds blue instead of green. Remote sensing data suggests that Spotted Owls depend on cover from tall trees and not total tree cover, which has implications for fire management. The House sparrow decline in Spain is linked to air pollution and a poor diet. 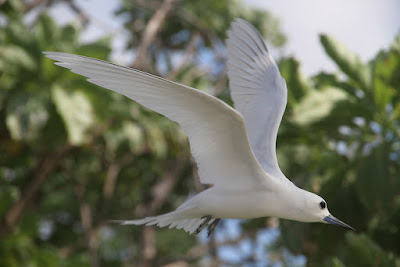 Birds in the Caribbean have historically faced hurricanes and tropical storms, but recent developments make their situation worse. Here is a list of the environmental regulations under attack from the Trump administration. The National Butterfly Center has announced its intention to sue over the construction of the border wall on its property. The urban-dwelling mountain lion known as P-41 was found dead, possibly because of factors related to the La Tuna Fire. Throughout the Bush administration, there were attempts to open Arctic National Wildlife Refuge to oil drilling, and now those attempts have been revived. A beetle from the West Coast is helping control New Jersey's hemlock woolly adelgids.